In her cookbook, The Pioneer Woman Cooks, award-winning food blogger Ree Drummond baked her way to the top of the New York Times best-seller list from her rural ranch kitchen in Pawhuska, Oklahoma. 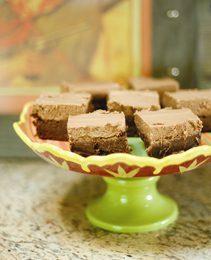 Her mocha brownies are topped with a coffee-cocoa icing, making them a totally acceptable accompaniment to breakfast. Preheat the oven to 325º F. Spray an 8-inch square baking pan with nonstick baking spray. To make the brownie batter, place the chocolate in a microwave-safe bowl. Melt the chocolate in the microwave in 30-second increments, being careful not to let it burn. Set it aside to cool slightly. In a medium mixing bowl, cream the butter and sugar. Beat in the eggs. With the mixer on low speed, drizzle in the melted chocolate. Add the vanilla extract and mix. Add the flour to the bowl and mix just until combined; do not over mix. Pour the batter in the baking pan. Spread it to even out the surface. Bake for 40 to 45 minutes, until the center is no longer soft. Set the brownies aside to cool completely before icing. In a large mixing bowl, combine the butter, powdered sugar, cocoa powder, salt and vanilla. Mix until slightly combined, then add ½ cup of the brewed coffee. Whip until the icing is the desired consistency. If the icing is overly thick, add ¼ cup more coffee. It should be very light and fluffy. Reprinted with permission from The Pioneer Woman Cooks: Recipes from an Accidental Country Girl by Ree Drummond. Published by William Morrow. The key to perfect pickled veggies is in the spice mix.